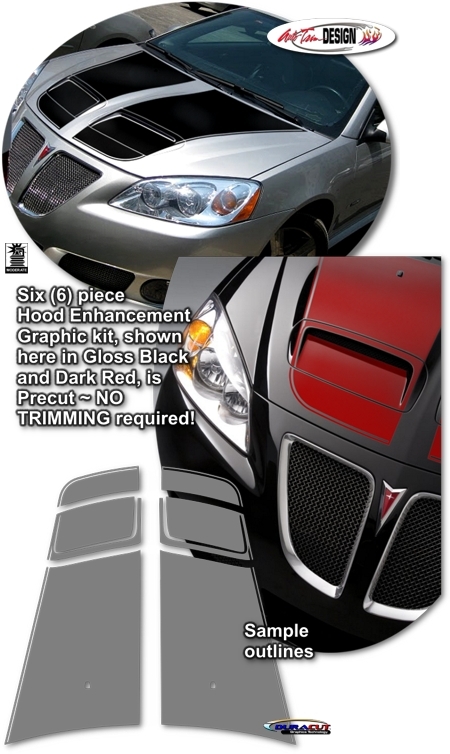 Make your '05-'10 Pontiac G6 unique with this tough-looking Hood Enhancement Graphic kit. Created specifically for G6's with the GXP Sport Appearance Package (SAP) style Hood (GM Part #25839143), kit is packaged as a set of six (6) pieces with a classic 1/4" (6.35mm) pinstripe at the outside perimeter as shown. They're PRECUT and ready to install in a wide variety of colors - NO TRIMMING required! Kit is specifically made for the G6 GXP Sport Appearance Package (SAP) style Hood (GM Part #25839143) and will not fit any other vehicle.